We provide customized service and help in implementing a complaint systems for manufacturers to monitor customer satisfaction that provide key input to their CAPA systems. 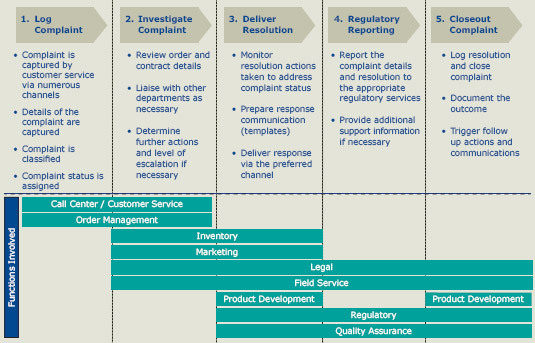 ISO/FDA’s inspection strategy have reinforced the importance of robust complaint investigations and record keeping. There will be productivity increase and cost savings of more than 70% using our service. Your company will save money from several thousand to millions of dollars adding to your bottom line profit. We can setup a system for Quality Assurance to routinely monitor service work orders, product replacement requests and complaints, to ensure that there is no evidence of a chronic or inherent product problem. If there is evidence that suggests a a problem, QA will escalates it to the appropriate group (Manufacturing, Product Sustaining Team, etc.) for further investigation. Once the investigation is complete, QA will works with a corrective action team to ensure that the appropriate actions are taken to correct the problem and prevent it from recurring. Complaint: Complaint means any written, electronic, or oral communication that alleges deficiencies related to the identity, quality, durability, reliability, safety, effectiveness, or performance of a device after it is released for distribution. (ii) Has malfunctioned and that the device or a similar device marketed by the manufacturer or importer would be likely to cause or contribute to a death or serious injury if the malfunction were to recur. Correction means the repair, modification, adjustment, relabeling, destruction, or inspection (including patient monitoring) of a device without its physical removal from its point of use to some other location. Correction or removal report number means the number that uniquely identifies each report submitted. Market withdrawal means a correction or removal of a distributed device that involves a minor violation of the act that would not be subject to legal action by FDA or that involves no violation of the act, e.g., normal stock rotation practices. Recall means the correction or removal of a device for human use where FDA finds that there is a reasonable probability that the device would cause serious, adverse health consequences or death.